So I saw this floating on a few other blogs like Pagan Culture and Living a Faerie Tale and decided to steal it since I thought actually making an entry would be a good way to start this blog. And why not start with some useless information about me? What does it mean? I don’t really know – but I believe it has to do with brightness and shining qualities? I did not choose it. 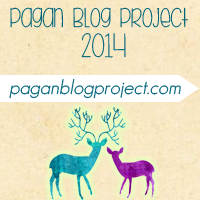 How did you find Paganism? Though hours of unsupervised time in bookstores and nature. No, really I was fascinated with the occult ever since I was a kid. My parents, thankfully, did not monitor my reading or internet usage. How long have you been practicing? Since I was 11-ish, but before that as well naturally… um so… something like 17 years? Solitary or group practitioner? Currently solitary but I’m not opposed to groups. I sometimes miss having a coven – especially during festivals and solstices. What is your path? Entirely eclectic, I began attempting the Celtic reconstructionist thing but took a turn into Hellenism as my magical practice became more serious. Oddly enough, I practice traditional witchcraft though. Are you out of the broom closet? Sort of, my family and friends for the most part know they just pretend they don’t or don’t ask questions. Professionally I am pretty private about my beliefs. Who is your patron God? Dionysos. Who is your patron Goddess? Aphrodite. The Morrigan. Do you fear darkly aspected Gods/Goddess, or rather respect them? I embrace them. I work a lot of with dark aspected deities including Lilith. Do you worship the Christian God? No. Do you ever worship animals? Not particularly no, though I do see them as divine. Or plants? No – but I see them as a part of divinity and I often use them in worship. Do you regularly commune with nature? Yes. Taken a camping trip just to talk to nature? Sure, but I need people with me as well. I am not a solo camper. Describe the moment you felt closest to Mother Earth? Definitely one of my spiritual quests in the woods – camping, becoming a part of nature. Have you ever called upon the powers of an animal in ritual? No, but I have felt animals have given me messages and feel connected to certain animals. Or a plant? Um… not the plant specifically but I have received divine messages under the influence of plants. Do you hug trees? Yes, often and just because. It’s grounding and I find it very peaceful. Give them gifts? No, not specifically. I leave gifts for the faery folk though like wine, whiskey, honey, milk, cream, cakes, tea, trinkets, sparkles, various things…. What is your favourite flower to work with? Poppies, roses, foxglove, moonflowers, daisies…. I love working with flowers of all kinds. What is your favourite tree to work with? Ash. What is your favourite holiday? Samhain. What is your least favourite holiday? Lammas and Imbolc because they’re stuck in the middle and I never know what to do. Have you ever held a ritual on a holiday? Yes – I always try to actually. Ever taken a day off work to celebrate a Pagan holiday? Yes. Do you celebrate Yule on the 21 rather than the 25? Yes – I celebrate Yule privately and Christmas with the family on the 24th and 25th. Have you ever felt the veil thin? Yes – certain times of year as well as at certain periods in my life. During some moments of near death as well. Ever danced the Maypole? Only once. Know what the Maypole symbolizes? Penises! Fertility. Phalli… So yes. How do you usually celebrate the Pagan holidays? Currently, privately and ritually. In the future I would like to celebrate with others. Do you use Tarot? Yes. Do you use a pendulum? No. Do you use astrology? Yes. Any other form of divination?I use trance work and scrying. What was the first spell you did? Glamour spell. What was the latest? A personal empowerment spell… is there such a thing? Ever done a love spell? Yes – but not the specific person sort. A healing spell? Yes but generally I do other kinds of energy work for healing. What was the most powerful spell you’ve ever performed? A cord cutting spell with someone I loved very much at the time, but the relationship was very unhealthy. What deities do you usually call on? Aphrodite, Lilith, Hecate…. Do you believe in Vampires? Sort of – not like the movies. Satyrs? Yes – totally into them! Ever used any of the above in magic? Fae often, satyrs, nymphs, elves yes… vampiric practices, check. Do you have one of them as a personal guardian? I used to yes, but I believe I’ve lost that connection unfortunately. I would like to re-establish that but I’m not sure that can be done. Own a cat? Not anymore. When you meditate, what does your happy place look like? An open field with flowers – woods on the edge – like the woods I grew up near. Do you believe in past lives? Yes, in a sense. If so, describe a few briefly: I don’t know any of mine. Do you believe in soul mates? I do, but I’m not sure if I believe they are to be forever lovers or sent to teach us something about our selves/guide us. Do you have a spirit guide? I an owl. Is it always love and light? Definitely not – it’s real life out here! Darkness and evil are necessary counterbalances to love and light.